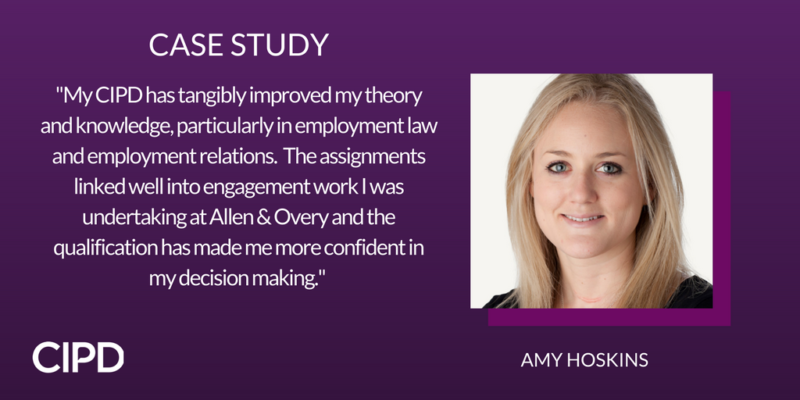 After completing a degree in Geography at the University of Nottingham, Amy, like many graduates was unsure of what she wanted to do for a career and ‘fell into’ HR after taking on graduate recruitment roles in the charity and legal sectors. After notching up some experience she decided a post graduate qualification in HR would help progress her career and she began reviewing training providers. Her research led to Watson Martin Partnership’s CIPD Advanced Diploma in HRM, an Active Learning programme which allowed her the freedom to manage the course at her own pace while offering support from a dedicated adviser and a classroom learning environment before assignments. “I didn’t want to be stuck to a specific time frame or commit to weekly seminars but I liked the idea of full day workshops where you could focus on one topic at a time and then tackle the assignment afterwards. The exam workshops, in particular, were fantastic and I felt really well prepared going into the exams,” she recalls. “I definitely made the right choice with WMP and enjoyed the learning process. I appreciated having my own tutor Dee Gemmell who was very approachable and was always there if I needed to ask questions. I also really liked how interactive the workshops were and have built a network of peers from different sectors with whom I’m still in touch. This was really helpful during the exams when we set up study groups communicating on Skype for support,” she adds. “The first is working with really senior stakeholders which can be intimidating and building credibility was difficult at the start. Having my CIPD has helped as I now have more knowledge and experience and I have built up some really good relationships. The second major challenge is about managing my priorities. I have a very busy workload and it can be difficult to juggle everything and fit in time to be as visible as I can be, which I think is important. The third is employment relations, where I don’t have as much experience and have worked hard to improve my knowledge. The CIPD qualification has helped me to trust my instincts and feel more confident in certain situations,” she says. Amy is certain that becoming CIPD qualified will help her progress her career and urges other HR practitioners to take the plunge. “I would recommend it to anyone as long as they are really committed. You will be better equipped to stretch yourself at work and if you are very organised you can do it in 18 months,” she adds. Why investing in your CIPD development is worth it – especially in difficult times	Welcome to Life in the Fast Lane – get CIPD qualified in just six months!